Are you #TeamLeggings? Leggings tend to get a bad rap from those who think they’re a terrible substitute for pants but we can all admit that they are very comfortable! They are definitely one of the most controversial pieces of clothing, but they don’t have to be. You can totally rock leggings all of the time (with the exception of interview outfits and other important dates) once figure out how to pair clothes with your go-to pants. Follow these five fashion tips and you’ll have no problem getting away with wearing leggings every day of the week. You can’t go wrong with a sweater dress and a pair of leggings. These Aritzia velvet-like ones are a great opt from the basic black pair. I find that when leggings are worn with a Poncho, a nice modern touch is added to the outfit. 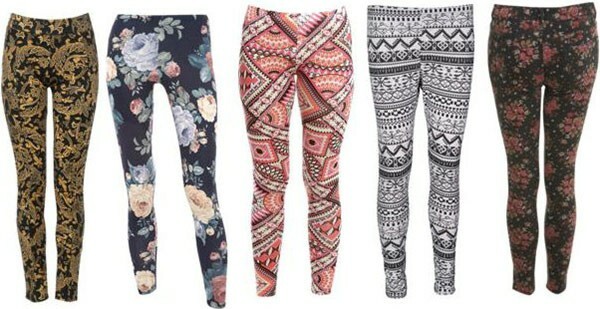 I like textured leggings because they could look just like pants. These lace ones are a perfect example. Leather jackets work great with leggings because they add some edginess to the outfit and provide a good balance if you don’t want to look too dressed up. Cardigans are easy to style because they practically go with everything, so why not wear one with leggings! Many people try to avoid wearing coloured and patterned leggings but I say go for it! While you’re at it, why not dress up the outfit with some accessories such as a hat and scarf. This outfit is perfect for winding down the week and getting ready for a relaxing weekend.These faux-leather leggings have a great slim fit and they can be dressed up or down. Pair them with a denim shirt and converse shoes to help finish this relaxed look.